SG-1 cautiously explores the darkened halls of an ancient, abandoned Goa’uld structure on another world. They step into a dusty room filled with the stench of death, and discover nine corpses long-since dead. The bodies are those of the Linvers — a rival league of lesser Goa’uld who challenged the System Lords. But they are no threat any longer, and the reason for their death is unclear. The team finds a Goa’uld tablet (similar to one found on Argos in “Brief Candle”), and the “page-turner” device that operates it. Daniel cannot seem to get the tablet to turn to the next page, and takes the devices back to Earth. Back at the S.G.C., Daniel soon begins to experience extreme hallucinations. He sees the corpse of one of the Linvers walking around — first as a member of SG-7 in the Gate Room, then reaching out of a Stargate event horizon in his closet. Dr. Janet Fraiser can find no medical explanation for the hallucinations, and considers the more likely cause: Daniel may be in the onset stage of schizophrenia. Even worse, it is theorized that gate travel itself may be the cause. Daniel is restricted from duty, and wishes to prove that he is not going insane. Jack keeps him company — but as the two play cards, Daniel sees a Goa’uld parasite slither up the Colonel’s arm and burrow into his neck. Though he believes it is a hallucination, Dr. Jackson can’t contain himself any longer. He jumps at Jack to try and get the Goa’uld out. This latest outbreak proves to Dr. Fraiser and Dr. MacKenzie (the S.G.C.’s mental health physician) that Daniel Jackson is sliding down the path of insanity. He is taken to a nearby hospital and medicated. He spends the next few days dealing with his hallucinations from the confines of a white padded cell. His teammates come to visit him, and have a hard time watching their friend and colleague struggle with mental illness. Daniel continues to be paranoid, seeing a walking Linvers corpse standing behind his friends. He jumps to his feet and runs at it, but Teal’c catches him. “Ma’chello,” Daniel whispers as he falls unconscious. Jackson’s vision proves true when Teal’c falls suddenly ill less than an hour later. Dr.Fraiser does all she can, but cannot help him. His larval Goa’uld symbiote is dying. Dr. MacKenzie enters Daniel’s cell to speak with him, and Jackson tries to convince him that he is cured. Daniel has remembered the inscription on the Goa’uld tablet device: “To enter by infiltration.” He believes that the device was left for the Linvers by Ma’chello,a scientist who invented technology to fight to Goa’uld, whom SG-1 had met six months ago(“Holiday”). Daniel’s explanation convinces the doctor to call for Jack O’Neill. Jack leaves Teal’c’s bedside immediately, and confirms Daniel’s theory that Teal’c is sick.Daniel explains his theory, and the two return to the S.G.C. After Ma’chello’s death, the S.G.C. recovered his inventions and stored them at Area 51. They find the tablet and page-turner devices, and bring them into the containment lab. With O’Neill looking on, Fraiser and Carter discover that each page-turning device contains 10 Goa’uld-killing “bugs” that infest a person. While the devices kill a Goa’uld, they simply drive a non-Goa’ulded human crazy. The containment vessel is not enough to hold the creatures, who escape and burrow into Sam,Janet and Jack. Because they each have three in them (Sam has four), their psychotic symptoms are rapid and acute. But as Fraiser and O’Neill slowly go insane, Major Carter realizes that she is suffering from no symptoms. After a few minutes, the four devices emerge from her ear and die on the floor. She hears the voice of Ma’chello. Sam realizes that the devices must have detected the protein marker left by Jolinar, theTok’ra who joined with her a year ago (“In the Line of Duty”). Because the Goa’uld within her had died, the devices assumed they had been successful. Now all she had to do was inject her proteins into her two friends. It is enough to convince the Goa’uld-killers that any Goa’uld in Jack and Janet are dead — they leave their bodies. The Tok’ra aren’t the only Goa’uld who oppose the dominant System Lords (made up of several dozen of the most powerful Goa’uld). The Linvers were a small group of nine lesser Goa’uld who challenged the dominance of the System Lords. It is ironic that Ma’chello’s anti-Goa’uld technology killed this group that was working to overthrow the System Lords — though Ma’chello would have likely made no distinction between System Lord, Linvers or Tok’ra. It is uncertain as to whether or not Ma’chello intended to attack the Linvers specifically with his inventions — but it seems likely, since the tablet and page-turner device found their way into the Linvers’ secret meeting chamber. SG-1 notes that the Goa’uld tablet found in the Linvers chamber is similar to one found on Argos (“Brief Candle”). The tablet is a data storage device, which requires a supplemental hand unit to “turn” the page that is displayed. Note that Ma’chello’s Goa’uld-killers do not kill the human host of a Goa’uld — only the parasite itself. The lives of Jackson, O’Neill and Fraiser were threatened because,without the presence of a Goa’uld, the devices caused them to go insane. Teal’c’s life was at risk because the device attacked not him but his larval Goa’uld symbiote — which serves as his immune system. The Linvers host bodies died not because of the devices that infected them, but because the door mechanism was damaged inside the room (perhaps by a Linvers on the verge of death, trying desperately to escape the room). The host bodies apparently died of starvation after their Goa’uld were already dead. When their Goa’uld symbiotes died, they left protein markers in the host bodies. The symbiote rapidly decayed and was absorbed by the host body. Ma’chello himself may have written the contents of the tablet used by the Linvers — if Daniel’s theory is correct that the inscription (“To enter by infiltration”) referred to the Goa’uld-killing inventions and not to a Linvers battle plan. It has been six months since Ma’chello’s death (“Holiday”), though the Linvers have been dead only one month. His anti-Goa’uld technology continues to be used effectively after his death. Was this tablet simply not acquired and/or used by the Linvers until recently, or might Ma’chello have someone still working for him, using his inventions to fight the Goa’uld? The S.G.C. returned to Ma’chello’s planet after his death and collected all of his inventions and technology, crating them off to storage at Area 51 on Earth. It is unknown whether any of the devices have yet been examined or studied — but reverse engineering could certainly prove an invaluable asset in Earth’s struggle against the Goa’uld. Ma’chello’s Goa’uld-killers can pass through glass, rubber, flesh, and presumably many other materials without leaving a mark. Goa’uld-killers leave the body through the ear once the presence of the unique protein marker is detected. They can be “fooled” into leaving before the symbiote is dead, presumably, by injecting the victim with the blood proteins of someone who once carried a Goa’uld (as long as the Goa’uld died within them and was absorbed into their body). If a Goa’uld dies inside its host, it does not leave a protein marker unless it has fully blended with the host body. Colonel O’Neill, for example, was implanted with a Goa’uld that did not finish blending with him (“Into the Fire”) — and thus did not leave him with the same sort of protein marker that Jolinar left Sam (“In the Line of Duty”). O’Neill and Fraiser may now have the Goa’uld protein marker, allowing them to use Goa’uld technology and sense the presence of a Goa’uld. More likely, however, is that their bodies will simply wash Sam’s blood components out of their systems. The S.G.C. has a medical containment unit, in which base personnel can perform follow-up procedures to personnel or acquired technology. The S.G.C. has a local psychiatrist on staff who monitors the effects of gate travel: Dr. MacKenzie. Fifty-three percent of S.G.C. personnel have a history of headaches. The page-turning device used with the Goa’uld tablet is referred to as a “P.T.D.” for short. Daniel Jackson – Daniel suffered from the deadly legacy of Ma’chello’s anti-Goa’uld technology. 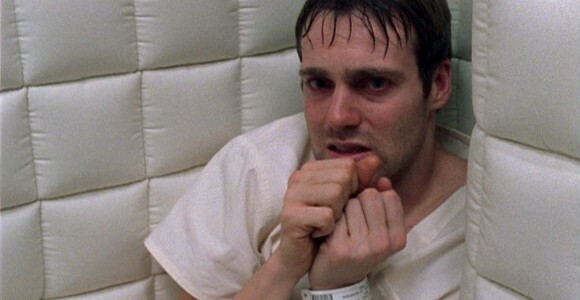 After being infected by one of the Goa’uld-killers, Daniel suffered from hallucinations and other symptoms of mental illness. He was committed to psychiatric custody and heavily medicated. Jack O’Neill – Jack was forced to watch his friend and colleague slowly go insane — apparently due to gate travel. It was obviously a difficult thing for him to witness, as a man who is use to being in control of all his faculties. O’Neill does not have a Goa’uld protein marker from his experience with the symbiote implanted in him by Hathor (“Into the Fire”). When the Tok’ra put Jack back into cryogenic freeze, the parasite either died inside him or was forced to leave his body before the blending was complete. Samantha Carter – The presence of the Goa’uld protein marker left by Jolinar of Malkshur has at least one other benefit for Carter: it has rendered her impervious to some of Ma’chello’s anti-Goa’uld technology. The Goa’uld-killers were programmed to leave the body after the Goa’uld was dead; and Sam’s former symbiote is dead. Sam was also forced to watch Daniel, her friend and fellow scientist, go insane. It was a painful experience for her, and will certainly affect her relationship with him. Janet Fraiser – Although she finally came through with a solution (even while being driven insane by the Goa’uld-killers), Dr. Fraiser erred in her rush to judgment on Daniel’s mental condition. The experience may cause her to be less impetuous in her diagnoses in the future. How did Ma’chello get his technology into the hands of the Linvers to destroy them? How was the door mechanism inside the Linvers meeting room destroyed? Have Area 51 personnel begun to examine Ma’chello’s inventions yet? Will O’Neill and Fraiser retain Sam’s Goa’uld protein marker? Are any of Ma’chello’s other anti-Goa’uld inventions still out there? VOTE! How would you rate SG-1's "Legacy?"